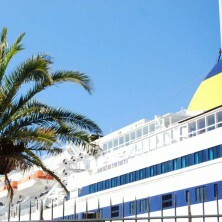 Toulon is France’s leading port for ferry services to Corsica ! You can also reach Balearic Islands and Sardinia from Toulon. The Tourist Office will be delighted to answer all your questions on ferry lines, travel to the ferry terminal and nearby hotels, to ensure your stay is a success from A to Z. How to reach the ferry terminal from the railway station? Buses number 3 and 23 run from the railway station to the Mourillon. Get off at the “Mayol” bus stop. Journey length: 10 minutes approx. Check out the timetable at Réseau Mistral. A taxi rank is located just in front of the station. For summer direct flights between Hyères-Toulon airport and Bastia or Ajaccio, please check the schedules and book your Air Corsica plane ticket ! What can I do if I have some time to spend in Toulon before my boarding ?